When you ride a motorcycle, you will have very little protection and therefore, if you are involved in a motorcycle accident, you may suffer serious and debilitating injuries. The process of building an effective personal injury claim is essential to help ensure you get the financial compensation you need and deserve. After a motorcycle accident, you may have climbing medical bills, the cost of future medical care, lost income from work and more. While personal injury laws provide guidance to help victims make their case and pursue compensation from the responsible party, motorcycle riders can face some challenges when it comes to receiving the justice and compensation they deserve. Unfortunately, challenges may still occur. 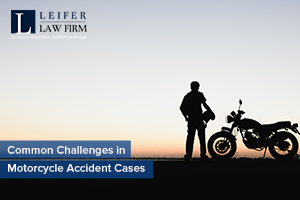 Some of the most common challenges that occur after motorcycle accident cases can be found here. In many cases, a motorcycle accident results in serious or even catastrophic injuries that cause life-altering repercussions. Since injured riders will typically have a longer recovery period and more medical needs now and in the future, determining the full scope of an injury and how it can impact the lives of a victim will take time, and may increase how long a case takes to settle. It is important that the injuries and their impact are fully understood to determine what a fair amount of compensation would be. Also, in many cases, medical experts need to be brought in to speak about the extent of the injuries. One of the biggest hurdles and hindrances in many motorcycle accident cases is the insurance company. These are powerful corporations that are always putting their profits before people to protect their bottom line. It is important to remember that the insurance company is not on your side. If you don’t have legal representation they may make an extremely low offer that doesn’t begin to cover the cost of the accident. Motorcycle riders are extremely susceptible to a number of negative stereotypes which can complicate matters when establishing liability and fault. The other drivers, as well as their insurance company, may try to capitalize on these stereotypes when trying to fight who is liable for the accident, such as speeding, unsafe lane changes or reckless riding. If a motorist is able to put the blame on a motorcycle rider, they may avoid having to provide compensation to the victims, or even pay less than they should. Because motorcycle riders are often severely injured after an accident, they may not be able to collect very much information at the scene. While this is understandable, this lack of documentation may complicate the case, if they file a lawsuit. This is why it is so important to call the police after a motorcycle accident, who will be able to collect vital information and compile a detailed report of what happened. An attorney will also be able to conduct an investigation regarding what happened to help build a case for the victim. If you are involved in a motorcycle accident, you should contact an attorney in Florida for help. They can collect evidence and build a case to help you get the compensation you deserve. More information about motorcycle accident attorneys can be found by contacting the lawyers at Leifer Law by calling (561) 440-7683.